Call it short-lived enthusiasm or a steamy love affair gone cold but I’d rather think of it as a case of “too many things to do but so little time”. That has been my proverbial excuse when caught up in miscarried plans and rightfully so. The truth is I have yet to think of something I really love to make or do that makes me disinterested for no reason at all. I will definitely get back to it at the first opportunity because it is love. Such is the case of my affinity with butter cookies. I could not believe my eyes when I saw my post draft which dates back to October of last year. It was September when I was making butter cookies almost every day trying to capture that French Sable taste and I felt I was so close and all I needed was real French butter. And so the search began although I did not really look that far. I found some Irish butter at Fresh & Easy and Trader Joe's but didn't buy any.... I want French butter specifically! 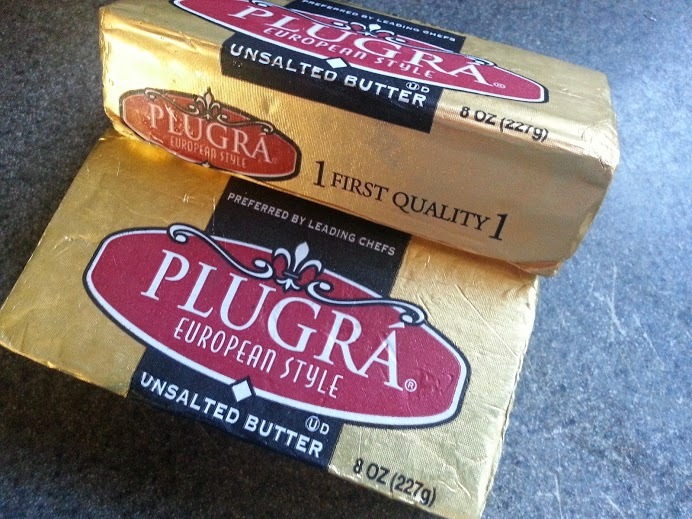 Until I found these at VONS... yippee, European style butter and as the label says, preferred by leading chefs. This will do for now. And so my sables became a reality but didn't post about it. I don’t know what happened- I just had so much going on in the kitchen then and the draft just got pushed back and far and farther away. I feel it’s a little old so I have to do it all again and more because I'm craving these French sables. So I went to the task of creaming the butter; adding the sugars, pure vanilla and finally, the flour. Kneaded the dough a little …. Oh my! It’s super soft and it’s not because I added more liquid stuff to it- no liquid ingredient actually but because of the hot weather I’m sure. Thankfully it needs to be refrigerated for three hours at least before baking. I gave it a full day to chill and the flavors to develop. Baking butter cookies during winter is definitely way better than in spring especially when this spring feels like it’s already summer. I couldn't do it with the biscuit cutter because it softens way too fast. I made four decent ones and an almost shapeless fifth before I decided to put it back into the fridge to firm up. Forming it into a log is the last recourse to make it work. I rolled it into some Demerara sugar then sliced them. They were not even perfect rounds. But it's all about the butter. The mere aroma wafting from the kitchen tells you what they're made of. The cookies have that perfect crumb that melts in your mouth; they have that wonderful Demerara crust which gives a little more sweetness as I used very minimal sugar in the dough. Really I had to exert maximum self control or I could have finished it all. I still love La Mere Poulard Sables but these are are just as good. Come to think of it, they're even better because they're freshly baked. In a stand mixer fitted with the paddle attachment or in a large bowl with a hand mixer, mix the butter on low speed until smooth and creamy (you don’t want it to get light and fluffy), about 1 minute; mix in the salt. Add the vanilla and the confectioners’ sugar and mix until smooth, about 1 minute. Scrape down the bowl as needed. Add 1 egg yolk and mix for 1 minute. Still on low speed, mix in the flour just until blended; the dough will be soft. Turn the dough out onto the counter and knead it gently a few times. Divide it in half and shape each half into a 9-inch log. Wrap the logs in plastic wrap and refrigerate for at least 3 hours. Bake the cookies, rotating and swapping the baking sheets’ positions halfway through, until the cookies are brown around the edges and golden on the bottom, 16 to 20 minutes. Let cool on the sheets for 5 minutes; then carefully transfer to a cooling rack and let cool completely before serving. These look so delishy! Did you make them for your b-day? Happy B-day (yesterday) my sweet friend. Thanks Ms JC ... I actually baked them before my birthday.